At National Helicopters we pride ourselves on offering an unrivalled helicopter tour experience. Our Tours are almost 3x longer which means you'll get to see more as well as be in the air longer. When you couple that with the excellent service, friendly pilots and attention to safety, it'll be an experience you'll never forget! 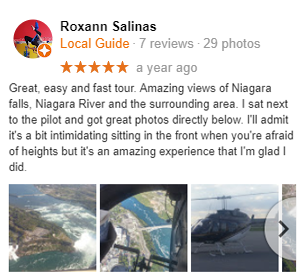 The Niagara Grand Tour is the most popular Niagara Falls tour flown by National Helicopters. 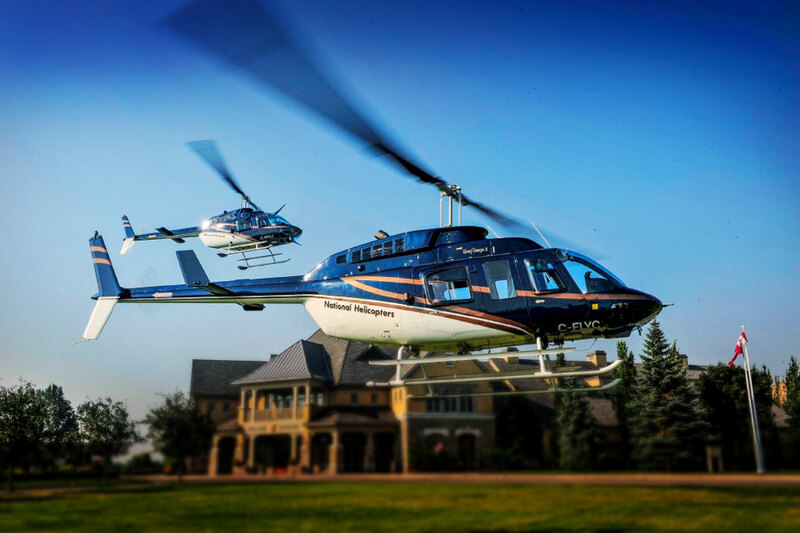 It is a twenty minute flight that departs the Niagara District Airport and flies over Niagara's world renowned wine producing region on the way toward Brock's Monument in Queenston. Once over Brock's Monument, the aircraft turns southbound along the Niagara River, flying past the Sir Adam Beck Hydroelectric Generating Station, the Whirlpool Rapids, the Spanish Aero Car and the Maid of the Mist below. 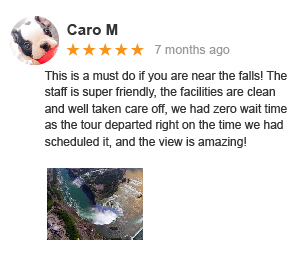 The tour culminates with an unforgettable view of the American Falls, Bridal Veil and Canadian Horseshoe Falls from high above. The helicopter will make a second pass over the falls so that passengers on the other side of the aircraft get the same view. The helicopter then retraces its route back to the Niagara District Airport. Our most popular tour. Discover Niagara from the Sky on a 20-minute flight over the Majestic Niagara Falls, historical landmarks and Niagara's renowned wine country. See it all in a way unimaginable from the ground. Don't forget your camera! Book your Niagara Grand Tour here! 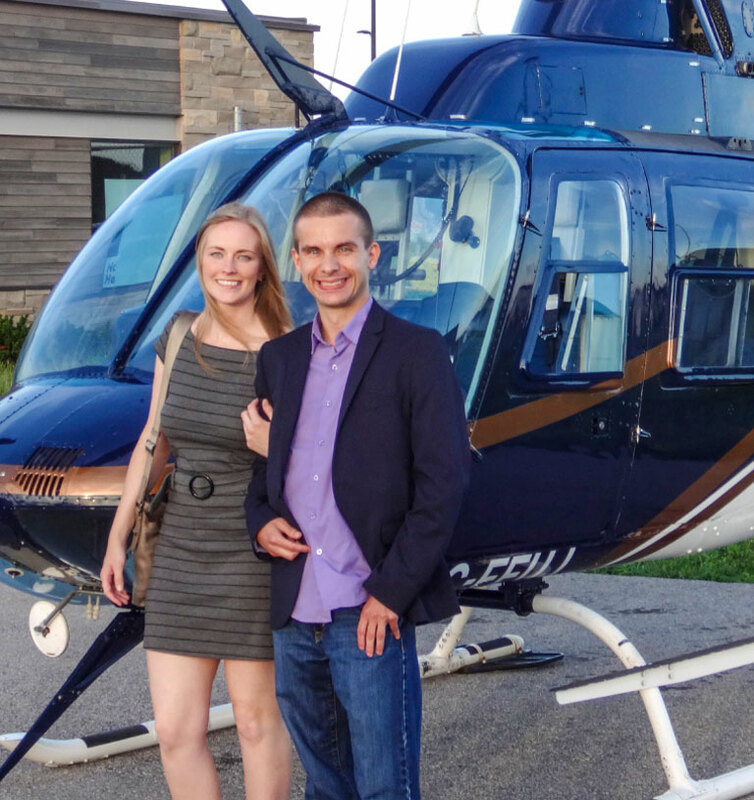 A Winery Niagara Grand Tour normally begins with a twenty minute Niagara Grand Tour for a private group of passengers and ends with the helicopter landing at a specific winery to drop the passengers off for lunch or a wine tasting. 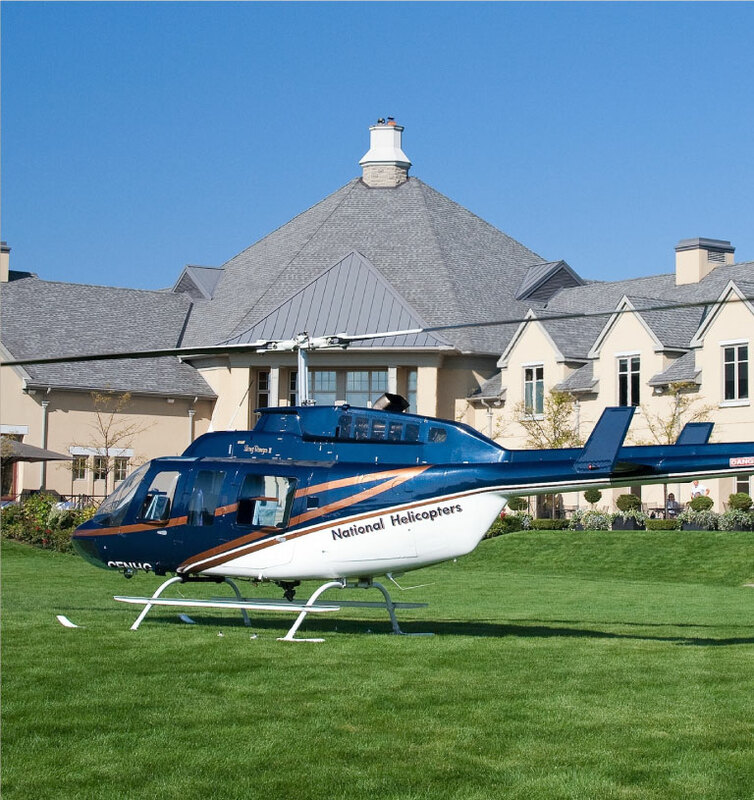 The price for the winery flights includes a ride back to the Niagara District Airport in the National Helicopters shuttle from the winery following the wine tasting or meal. 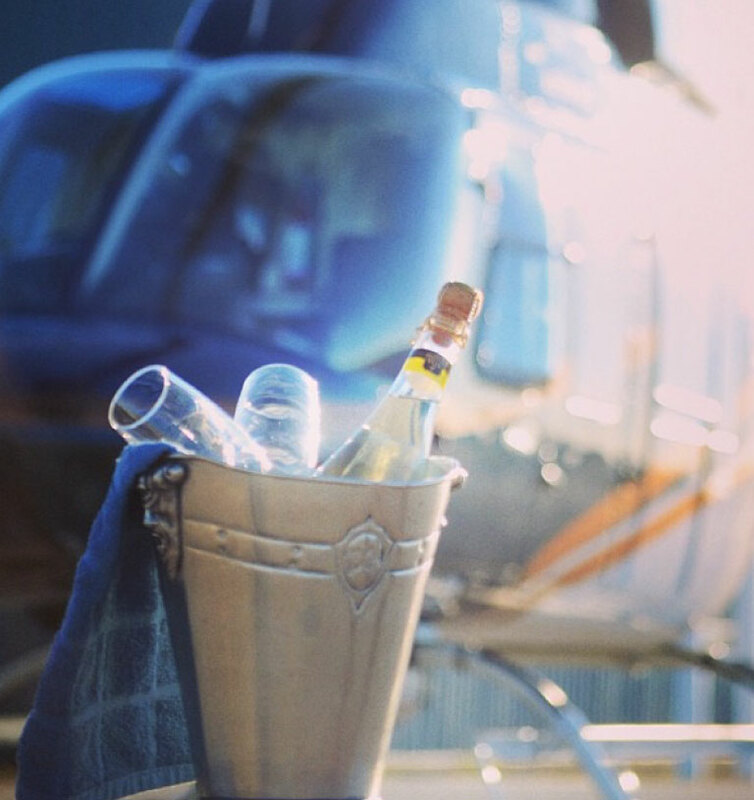 A helicopter pick up at the winery can be requested for an additional fee. 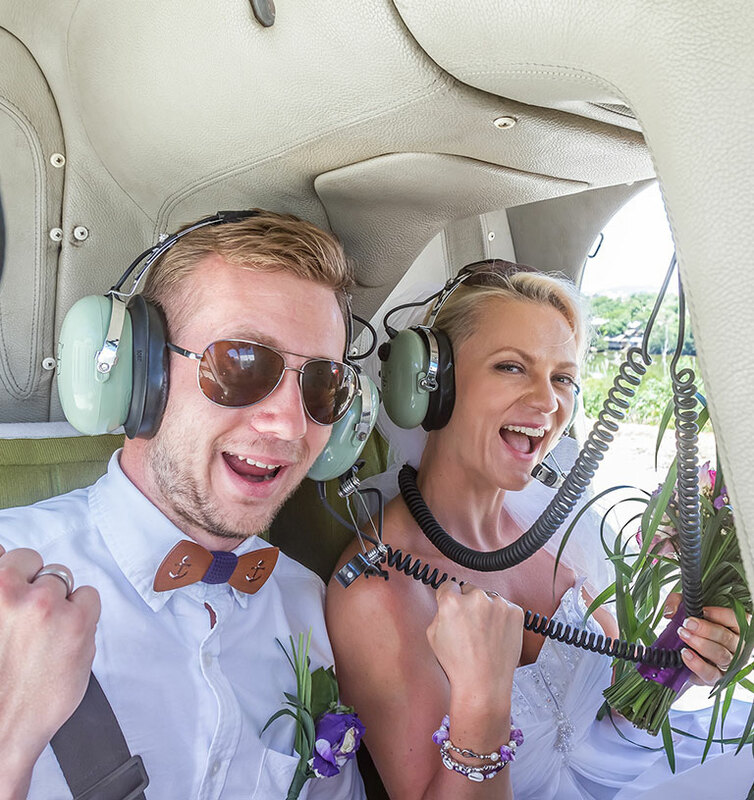 National Helicopters offers in-flight weddings charters complete with a pastor, bridal bouquet, photographer and limousine. Wedding details can be customized by contacting The Wedding Company of Niagara. 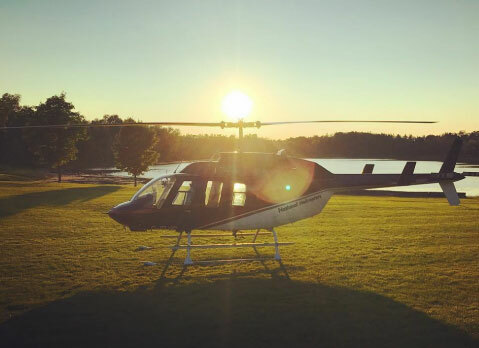 The Sunset Niagara Grand Tour follows the same twenty-five minute long route as the Private Romantic Tour but the helicopter will depart the Niagara District Airport shortly before sunset. 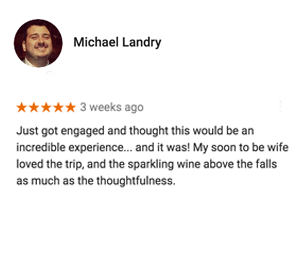 The Private Romantic Tour is similar to the Niagara Grand Tour but it is five minutes longer in duration and includes sparkling wine onboard the aircraft for the passengers. The similarity to the Niagara Grand Tour ends once the aircraft approaches the Queenston-Lewiston Bridge on the way back from passing over Niagara Falls. Instead of heading directly back to the Niagara District Airport at this time, the aircraft will continue northbound along the river to Niagara-on-the-Lake, then follow the shoreline of Lake Ontario westbound to the Welland Canal. Once the aircraft has reached the Welland Canal it will turn southbound, following it back to Niagara District Airport. 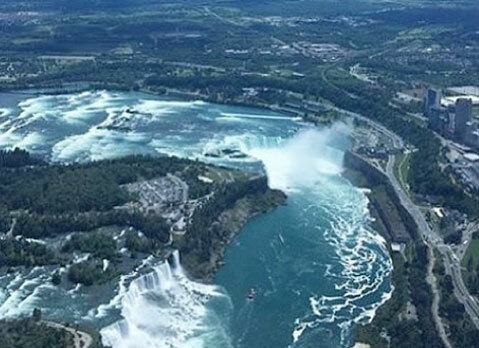 NATIONAL HELICOPTERS invites you to discover Niagara from an Eagle's eye perspective. We are more than just a helicopter Tour, we are Niagara's only Heli-touring company providing the view of only the best of Niagara Falls and the Niagara historical surroundings. National's aerial tours are the most personal and the most comprehensive adventure tours offered. 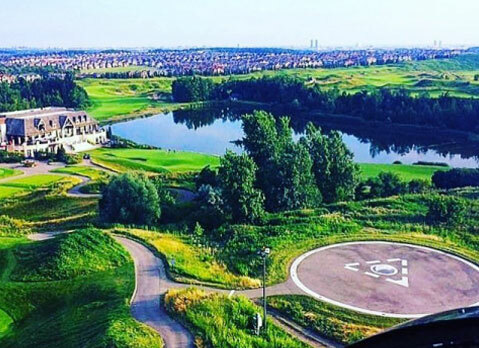 This leading Niagara attraction is not to be missed! 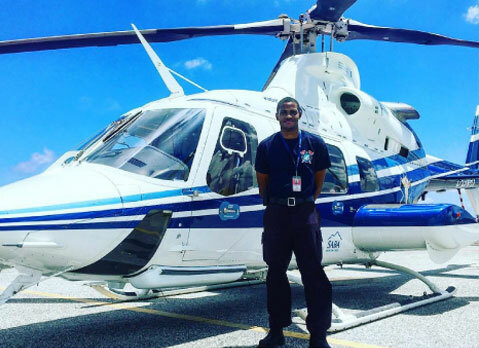 Have Some Question About National Helicopters ?